I'm very happy to see that we will have a new map pack from you guys. Thanks a lot for the huge amount of work you put in this mod since years! I won't lie if i say that i'm even happier (and proud) that you included D913 and Berlin 1945 in it (latest versions are 0.98 for D913 and 0.76 for berlin). The 4p_D913 is the version 0.98 but for the 2p, i had found only the version 0.97. I will update ( Berlin is already the good version ). I know .. i know. I wanted to update BUT the problem is the conflict with players who has no mappack. Same for Road to cherbourg and the object liked to a player ( not the world ) and change the rain to the sun in first position ( for no need change all the time ). But i can add the new and keep the old for the moment ( and remove the old map when this mappack will be official). Playmobill wrote: [*] Berlin 1945: For those who are worried about lags in 4v4, i spent a huge amount of time to prepare Berlin to be well optimized, with the expercience i had after doing Veules (which major flaw was the optimisation). I remember that you had posted this map on the old forum. 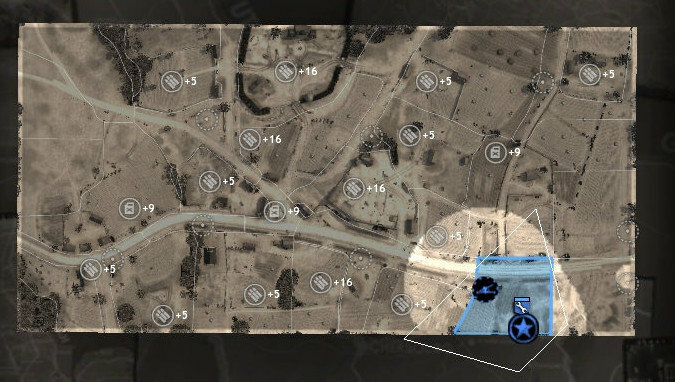 This is the alone 8p map with city where i don't have lag ( i play normally only desert map ). Good Job! Playmobill wrote: [*] D913: probably my best map, not the most known, but its the most competitive for sure. its also the map i spent the most time on, and had the most feedbacks to improve it. Kudos to all players that helped me to improve it! This is a very good map, good job again ! But after have play a pvp with Tiger1996. He and I think this map is a little too small for 4p but it's not dramatic :p (2p version should be better ). Playmobill wrote: Letme know if its still possible to include above maps, or if you need more infos about those. I know the map pack is supposed to be finished , but we dont have a new BK mappack everyday, and my last similar post for future mappack was lost in the previous forum. It's like more a "beta". Initially, i had sent to Wolf and Tiger1996 but after no response from Wolf , Tigger1996 decided to post for all. Egletons (2) by Cam51 - 2010 Relic/GR map contest winner! Egletons is same Alsace moselle, already included by relic a long time ago. You still creates/change map ? Ps: Si tu veux, tu peux me rajouter sur steam ( Endro ). I would change sectors of Road to Cherbourg (6) because this map have toooo many munitions. It's a very good map but too many arty/air spam. Simply brilliant... Nice work Endro! I would go even farther, and remove all +16 ammo. 82 is still a lot, 70 (2x +10) will be fine imho. I will look into my files how it behave with NSV Coh and also if i still have my photoshop template to make tactical maps 'Relic' style. Funny note about D913 is that the map was designed as 1v1, tested heavily as 1v1, all feedbacks are from 1v1, i just made a 2v2 version on the fly because.. why not. i agree its small, but its still playable so i kept it. both version should be 0.98, both include in the map pack of my first post. ps: PM sent Endro to add me in steam, i cant find/add you, my steam is legendary bugged for that. It might be true that i have actually expressed how much happy I am to see that you are still around, however... For confidential reasons.. there is one task of which i must ask you to fulfill in order to verify us your truthful identity. I mean, we have actually reached to the point where we need to know whether you are really Playmobill or just someone who is faking him! And so, I am afraid you need to prove to us. Doing so is very simple. As I can see that you haven't actually logged in to the Relicnews forum since 2014! Please log in to the Relicnews forum once you see this post. Logged in and ready, sir! This is one of the map i want to work on since a very long time. Its one of favorite maps, build by a team of good map makers, this map is awesome but has a major issue: its laggy. I will ask for authorisation for map makers that did it, if they are still active. one of them is Neroleone if i remember. My plan is to put a drastic revision focused on optimisation on this map, aswell as a modification of victory points locations. Imho sector values are excellent (40 Fuel and 70 Ammo). Maybe some manpower points locations could be modified, but so far rest of sector layout looks ok to me. well i noticed at least 5 or 6 sources of water, ill have to get rid of most of them. I think we can keep the lake. i'll try to smooth terrain as much as i can to reduce tesselation of the ground, and i'm pretty sure i'll have to remove half of the trees (i'll do my best to keep the map overall look as close as its possible). Same for houses, i'll have to remove a couple of em, or replace em by ruined walls that cost way less ressources for engine.. Also some walls are not good for gameplay, and increase lags at some key locations so a couple of loong walls will be open/broken/removed. Also i will remove the rain and make the 'Dusk' athmosphere setting a real dusk. i made a little draft of what it could be on photoshop. Feel free to help me to place those VP if you think we can have better placement. - 40+ sources of water in the map.. ok its pretty, but cant match to a 3v3 in BK. Most of them are in OoB, but still, 40+ is way too much, ill try to get down to less than 10 including 3 within battle area. - i also found that some walls (like the church's) were accidentaly cloned into each others. - I started terrain smoothing and recreation of ditchs along roads with splines 'deform', instead of pure Heightmap editor. goal is to make roads and its side perfectly flat for heightmap, and then use spline's deform to recreate the same reliefs than it was on the old version. for players, it will look the same, but for engine, it will be way easier to handle. - Also i started to remove a lots of tiny objects that where nearly not visible, sometimes completly invisible into ground (legacy of some older relief probably), and im also starting to choose the trees that will be removed (goals is to make forest looks nearly the same, but with 1/3 trees less. So its a indept revision, but i think that we can gain a lot of fps, without loosing the spirit of the map. Just keep in touch with Endro, and send him everything you do! In order to not polute this Annoucement topic more than i already did, i created a new topic for La Chaudiere's revision, where i'll detail the changes and post screenshots. indeed, in his blood; in his flesh! Tiger, add these two in your module file. They already exist in bk map folder, just not "activated". Use to play these privately with some players. I must say that blija is such an AMAZING map really! Created by Neroleone.. but the loading screen says "w.i.p" or work in progress; are u sure the map is complete and has no bugs whatsoever? gambits is quite decent as well.. even though it contains some hills of which i don't really admire... However, i can't seem to find the creator of the map anywhere! Not on the loading screen, neither on the info tab :/ Do u know who created it? Blija, I can never say I'm sure it's bug free, but the countless times I've played on it with some others from our own mappack it was fun. N44 used it as well. I have the same feelings about gambit down, but players wanted more 4v4s and I preferred no bridges on a map over unpathable hills. I don't know the creator, it was just found in bk mappack already. Any news about patch release date? Or changes list? Alright, so.. here are some updates... La Fiere will have no water in the middle anymore, but some water will stay in some other areas though. And the bridge will be indestructible. La Chaudiere will no longer have a railway bridge at the corner, no more empty bunkers as well... And fixed VP positions. The new 2vs2 snow map called "Bizory" weather will be changed from hazy with heavy snowing to permanent overcast.. due to the fact that it was too difficult to see during the stormy blizzard. New 2vs2 map called "Bocage" has both "hedge_01" and "hedge_02" entirely removed.. in order to maintain smoother game-play without so much lag. Endro and Playmobill are actually doing all the job.. i am just an assistant... But I also have to thank Kwok for letting us know about the existence of both Blija and gambits down, both maps will be added. Some more modifications may also occur for other maps too... Endro is probably going to upload the next beta of the map-pack v2 some time soon hopefully! Endro is no longer available at the moment, due to some serious real life circumstances... Hope he is back anytime soon though. However, since he is no longer available... I have successfully managed to re-make the revision by myself. I have done the exact same changes Endro has made.. but the only difference, is that total ammo will be 70 instead of 82. As I have removed all the +16 ammo points and replaced them with +10 ammo points on the other hand! So its about 20+ new maps, and 10-ish maps revisions. As map "revision" i mean it can go from Sector Layout redesign, pathfinding hotfixes to total in-depth rework. LaChaudiere (6), Hill112 (6), LaFiere (6) are the maps that received the biggest redesign job, make sure you check those. It doesn't mean others Revised maps are worthless, but they just didn't needed the same quantity of time spent. Kudos to Endromede for the tremendous time spent rebuilding/reviewing/validating maps, and Tiger, for his active support aswell as ingame testings/debug/validating file by file. As a bonus, most maps received brand new Tactical maps. MapPack 2 is currently in final stage of compiling/debugging, expect it to be released very soon. Thanks to all players that helped us to debug map revisions, and thank you for your patience too! it has been a long travel. Do you have authors list or guys I need to give credit to in installer?